Justin and David have been busy developing the Concept Design over the past few weeks and it’s now pretty stable. 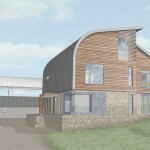 Here are some renderings which show how the new house is going to look alongside the re-built outbuildings. There have been a few further refinements to fine-tune the shading and the window sizes on the southern (rear) elevation in order to reduce the incidence of summer time overheating, but these renderings are a pretty accurate reflection of how the design being submitted for planning approval will look. 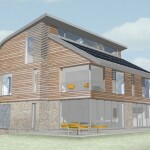 Just goes to show what you can achieve with SketchUp if you know what you are doing. 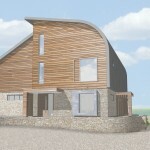 Concept Design by Marsh Flatts Farm Self Build Diary is licensed under a Creative Commons Attribution-ShareAlike 4.0 International License.